University of Toronto researchers are tracking the source of tiny pieces of plastic, called microplastics, that are making their way into Canadian waterways – one laundry load at a time. A study led by undergraduate students Hayley McIlwraith and Jack Lin, and Chelsea Rochman, an assistant professor of ecology and evolutionary biology, looks at how washing machines play a part in the release of synthetic microfibres (a kind of microplastic) into the environment, and the most effective ways of mitigating the problem. They specifically looked at two different products marketed as being able to reduce the amount of microfibres released by washing machines: Cora Ball and Lint LUV-R filter. U of T News spoke with Rochman about the team’s findings. What went into studying microfibres in washing machines? We know washing machines are a source of microfibres out into the lake or into the environment. We were interested to know how many microfibres shed from a single fleece blanket when we do a load of laundry. What we really wanted to know is if we implement these mitigation strategies that are currently on the market, how much would it mitigate the amount of microfibres that leave our washing machines and head to the waste water treatment plant? There are two undergrads that led the project, Hayley McIlwraith and Jack Lin. First they developed a method to be able to quantify the microfibres in an efficient way because it's not easy. And then they did laundry and quantified the microfibres in the washing machine effluent with and without those mitigation technologies – and then we compared. 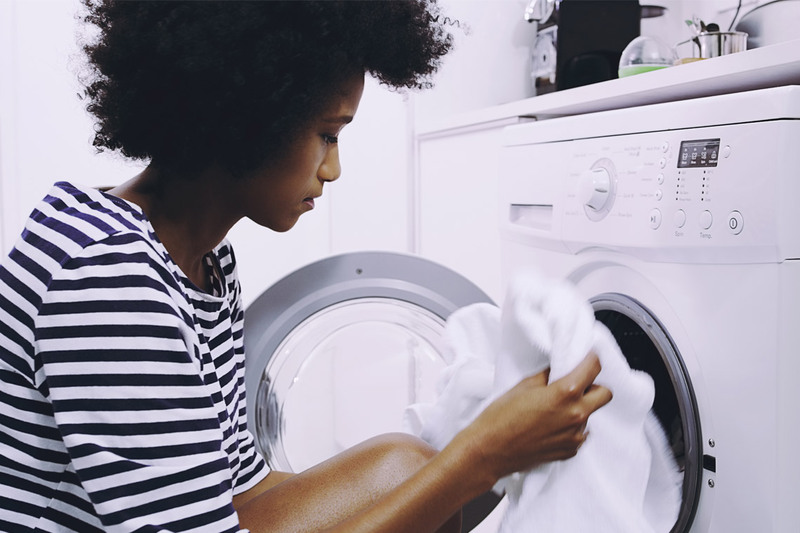 We found that if you put an after-market filter on your washing machine, which anyone can do – you can buy them online – it mitigates almost 90 per cent of all the fibers going out the back of the wash.
What kind of fabrics release microfibres? They can come from cotton materials, too, but the majority of our clothing these days is polyester and other types of plastics. A lot of textiles in the clothing we wear is made out of plastic, so when they shed fibers, they are microplastic. What would you want people to know about what their clothes are releasing into the environment? A lot of people hear about plastic pollution and microplastic in our lakes, but I don't think people realize that the majority of what we find, especially in freshwater environments, are these microfibres – these tiny little bits of textiles. While they probably also come from fishing gear and some of it comes from dust, we know that washing our clothes are a source. Every time we wash our clothes –whether it's the fibers, the chemicals associated with them, and of course dirt and other things that come out into the wash water – they exit out of our house and into the waste water treatment plant, where some of them will still make their way out to the lake. A lot of people clean out their lint trap in their dryer. They are in the habit of it and they do it because they're told it's a safety hazard. We're not talking about anything different in washing machines – we're talking about wet lint instead of dry lint. I don't think everyone realizes we are talking about laundry lint. In my opinion, it's not about every single person on the planet buying an after-market filter, it's more that washing machines should be made to have lint traps in them the way dryers do. Will you be continuing to study microfibres in laundry? We’re taking this small study and turning it into a pilot. My graduate student Lisa Erdle and my colleagues at Georgian Bay Forever are leading a study where they are putting filters in the homes of 100 different people in Parry Sound. In the township of Parry Sound, the waste water treatment plant operators are allowing us to sample before and after these people put them in their homes.